BRANDON, MB – An internationally-acclaimed musician and teacher at Brandon University (BU) has released her debut CD, exploring themes of European folk tunes and Romanticism. Violinist Kerry DuWors, Assistant Professor in BU’s School of Music, joins forces with pianist Futaba Niekawa in the group duo526 to present BALLADE. 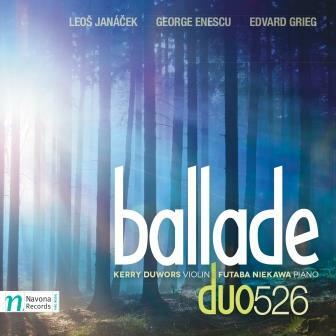 Released through Navona Records, BALLADE features violin sonatas by composers Leoš Janácek, George Enescu, and Edvard Grieg. DuWors has given performances across Canada, the U.S., Mexico, Italy and Germany, earning accolades for her artistic poise, maturity, and expression. She has played Carnegie Hall in New York City, soloed with the Winnipeg Symphony, performed with Yo Yo Ma, and toured with Jan Vogler. BALLADE can be previewed at: https://www.youtube.com/watch?v=rzFP98jwIyE&feature=youtu.be. To purchase, go to: www.duo526.com, or http://www.amazon.com/gp/product/B00K1JT7MC/ref=dm_ws_ps_cdp?ie=UTF8&qid=1399384538&s=music&sr=1-1.